Malnutrition rates have improved in Rajasthan, India in recent years—stunting (low height for age) rates among children under 5 dropped from 44 percent to 36 percent, and the wasting (low weight for height) rate has dropped from 20 percent to 14 percent. Nevertheless, the overall rates remain high and efforts must be intensified to address this public health crisis. 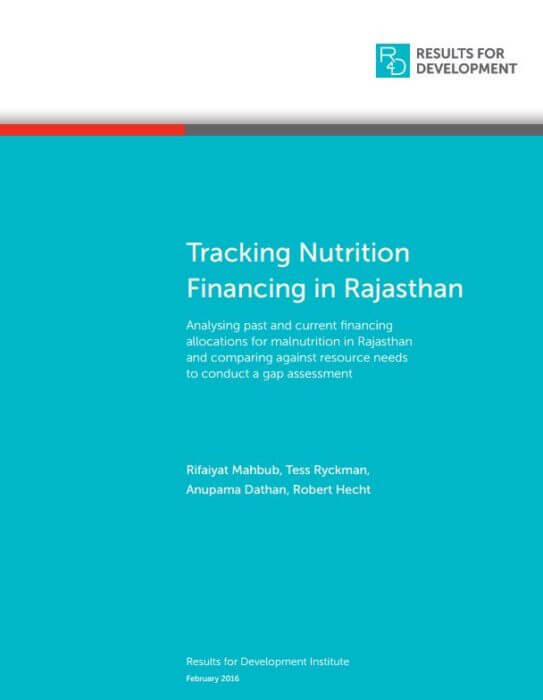 To support the Indian government in addressing malnutrition, Results for Development, with funding from the Children’s Investment Fund Foundation, has assessed government budgets for nutrition programs in the state of Rajasthan in order to estimate the gap between resource needs and available funding.